Gurumayi's Message for 2017 has given me a deeper experience of breathing. Breath has really become my "benevolent companion." It deepens my meditation and helps me to be present during the day. 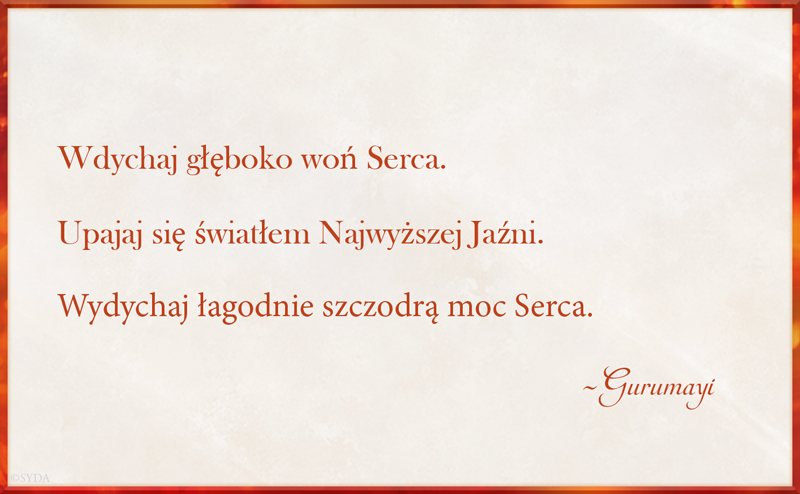 I love to stop my activity sometimes and breathe deeply three times, practicing Gurumayi's Message. My body becomes relaxed, my breath becomes expanded and full of shakti, opening my heart and making me feel lighter. 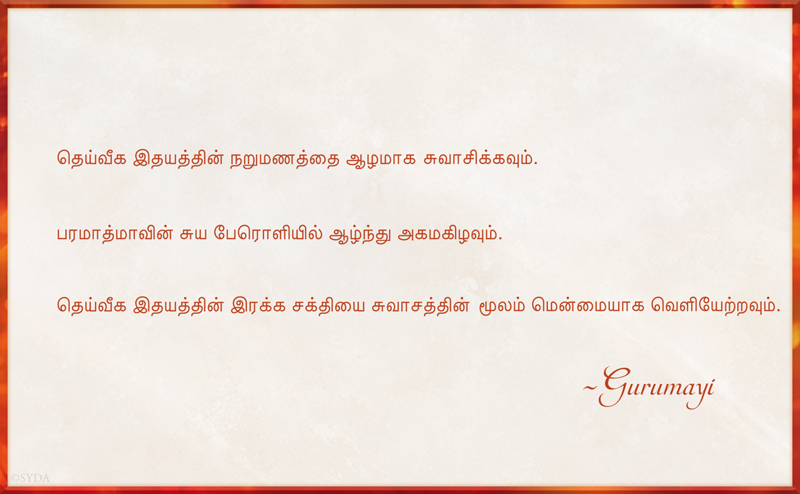 Every year, Gurumayi’s Message seems to manifest with more and more clarity in my day-to-day experiences. In the past, the workings of the heart have remained a bit of a mystery, but this year, 2017, the heart has become a delightful recurring theme for me. My heart has been playfully opening and softening, as I witness the sweetness of those souls who cross my path. My heart has been deeply touched by the kindness of friends, my children, and even passing strangers. This year has gifted me so many gentle acts of generosity and goodwill. For all of these acts and insights, I offer my grateful thanks to my dear Gurumayi, whose voice can strum God's music on my heart strings in an instant, and whose joyful laughter seems to brush my forehead like a summer breeze. Engaging with Gurumayi's Message for 2017 has had a profound effect on my spiritual practices. From the day after receiving Gurumayi's gift, meditation became deeper. 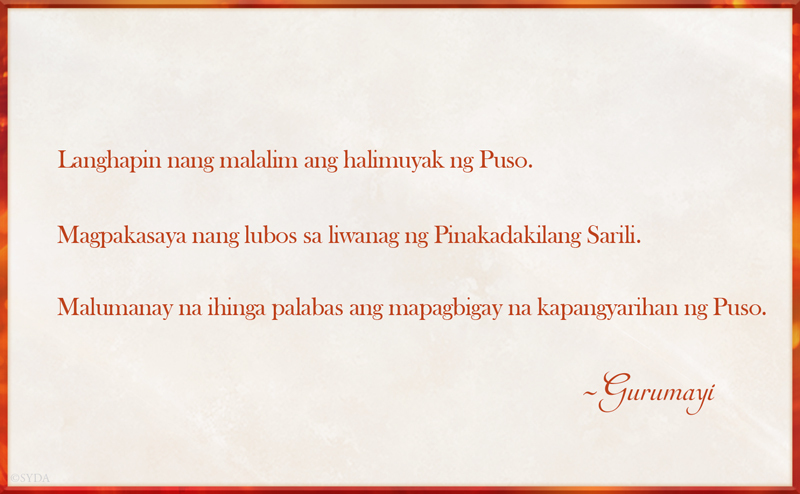 As I breathe in and breathe out, I see the advantageous balancing power of Gurumayi's words. The lines of the Message invite me to take a deep plunge into the perception of the Self, joyfully reside in that awareness, and bring that experience outward, gently, in harmony with the world around. As I do this, I feel the empowerment of making these teachings my own. 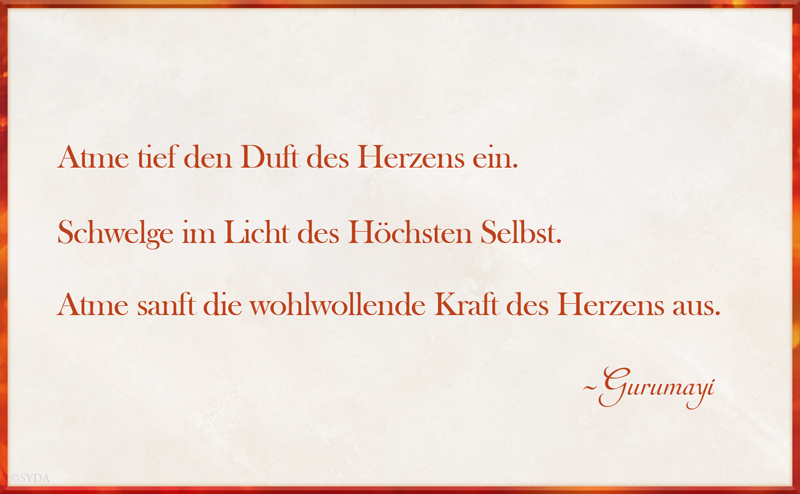 Recently, while chanting Shri Guru Gita, I became aware of my heart "thawing." I could feel forgiveness, becoming less judgmental and more loving towards myself and others. Now when I repeat Gurumayi's Message for 2017, I am in touch with these wonderful qualities over and over again. 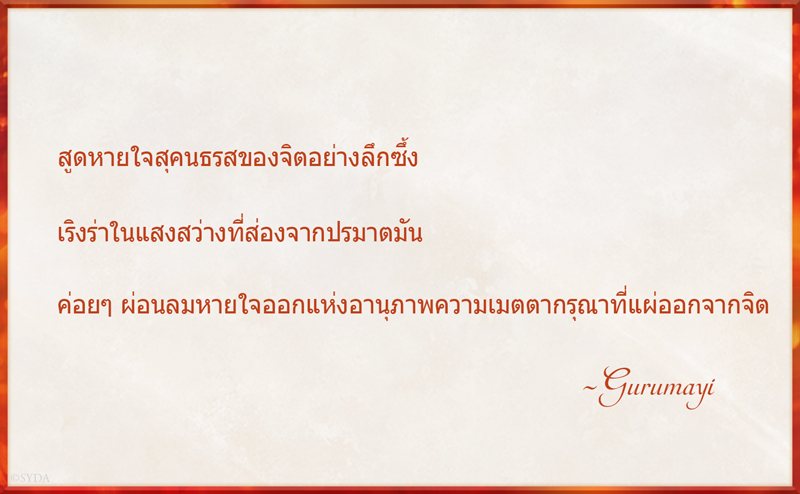 After receiving Gurumayi's Message, I began to repeat it, contemplate it, and meditate on it. I observed that practicing the Message in my daily life uplifts my thoughts toward myself, others, and situations. The Message inspires me to listen more and to feel empathy and compassion for myself and others. As I study Gurumayi’s Message, I have been inspired to reread her books The Magic of the Heart and My Lord Loves a Pure Heart to deepen my understanding. I am so grateful to Gurumayi for her Message this year. I love to repeat it again and again. It uplifts me so much. Ever since I heard Gurumayi's Message, I have been practicing it throughout the day. This practice fills me with ecstasy and showers the events of daily life with the light of the Self and the awareness of the Heart. The practice also creates a space for me to step back to, a place from which I can look at events in my life from a new vantage point. It helps me to redirect my mind to the present moment, to listen more carefully to the person I am with, or to see my work in a fresh new light. I am so grateful for the accessibility and immense benefit of the Message for 2017. Thank you, Gurumayi, for all the tools you give us to stay in the awareness of divinity at all times. I couldn't help noticing, each of the three times Gurumayi repeated each sentence of the Message in A Sweet Surprise Satsang, that she changed the way she said it—by adding a different inflection, a specific emphasis on different words in each line. So I tried doing this too as part of my practice. My heart dances with happiness when I do this. It's as if the emphasis that I add to the way I repeat the Message makes it more mine. For now, it's my favorite way to practice the Message. This practice is so much fun, and so full of happiness for me! During the last two weeks of 2016, I focused on mantra japa and on the cultivation of the divine virtues as one way to implement Gurumayi's Message for 2016. During this time of deep contemplation and practice, I saw the far-reaching consequences of my actions, both positive and negative. It also became obvious to me how much good we can do in this world by what we offer from the heart. To my amazement, when I heard the Message for 2017, it seemed to validate this conclusion, and I now have all year to contemplate it further! This morning I listened to A Sweet Surprise Satsang on the Siddha Yoga path website before I meditated. In the afternoon I visited my local art museum, and as I sat near an exquisite statue of the Buddhist goddess of compassion, Quan Yin, I reflected on the first line of Gurumayi's Message. It occurred to me that scents can be as sublime and multi-layered as the petals of a rose. As I sat there contemplating, I became peaceful and quiet inside. When I left the gallery, my mind was still. I noticed the details of the architecture. I smiled at a museum guide and she smiled back. I walked outside and perceived the beauty in the trees and sky. I felt Gurumayi’s Message come alive for me. Although I have just begun practicing Gurumayi’s Message for 2017, I am beginning to see its power to transform me. I have been yearning for many years to be able to find inner joy no matter what is happening, even during physical suffering. Recently, I have become more aware of the many times between moments of joy when I feel stressed and my breathing constricts. Now, when I think of Gurumayi’s Message during these moments, I follow her instructions and am able to experience the intoxication of the inner Self! At other times, when I am overly excited, if I recall the Message, I become calmer, grounded, and more connected to the deep source of love, joy, and gratitude. My life’s purpose is to become realized! I feel Gurumayi is giving me yet another step-by-step approach to take the quantum leap into the glory of true freedom. Gurumayi's Message for 2017 feels magical to me—like meeting an old friend. Often I find myself with an intellectual understanding of a teaching, yet I struggle to experience the meaning. However, I have found that I need only to remember Gurumayi’s Message and my breathing slows, after which a sense of peace and calm settles inside me. The in-breath, the pause, and the out-breath become a meaningful, heartfelt song to the Self. 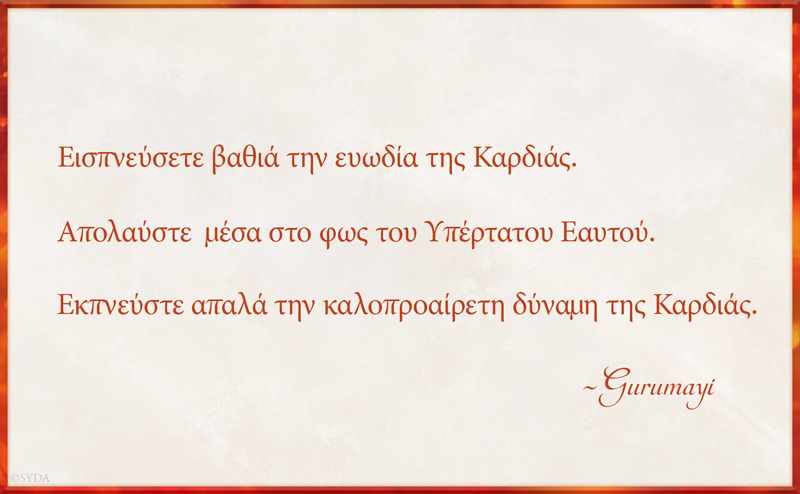 Thank you, Gurumayi, for the gift of this Message! 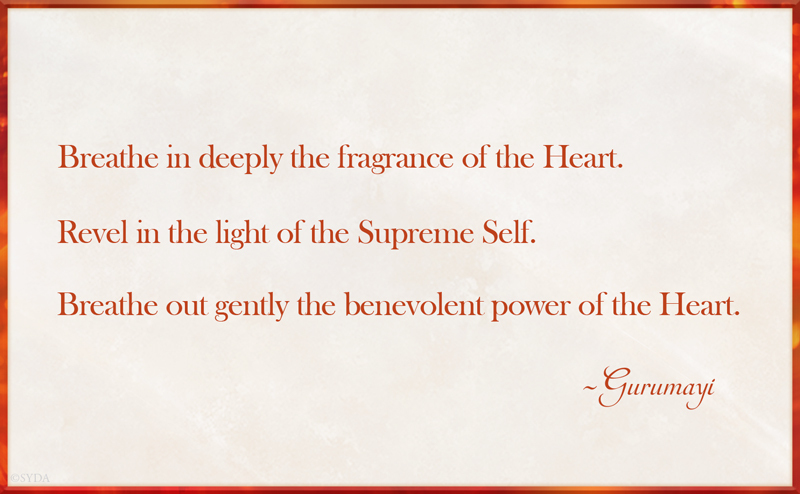 Every day, as I remember and repeat Gurumayi’s Message, I am rediscovering the Heart’s sweetness. 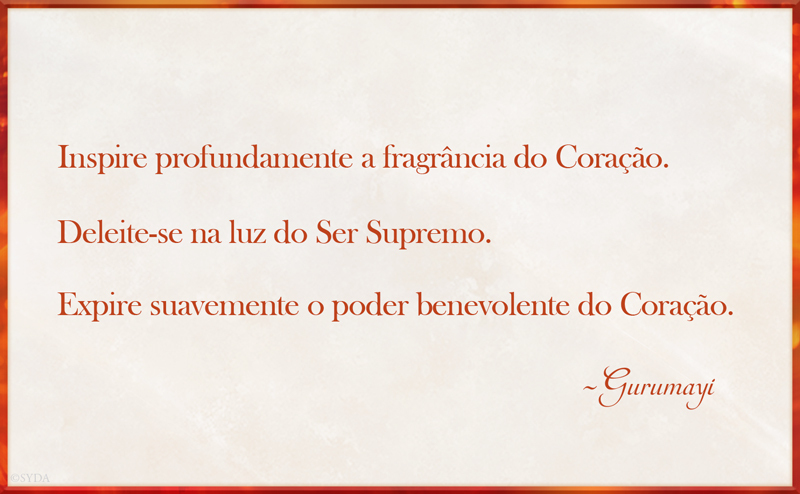 I feel I am breathing in—through all my senses—the love that Gurumayi bestows upon us. I am so grateful to Gurumayi for teaching me how to experience the light within my very own being. 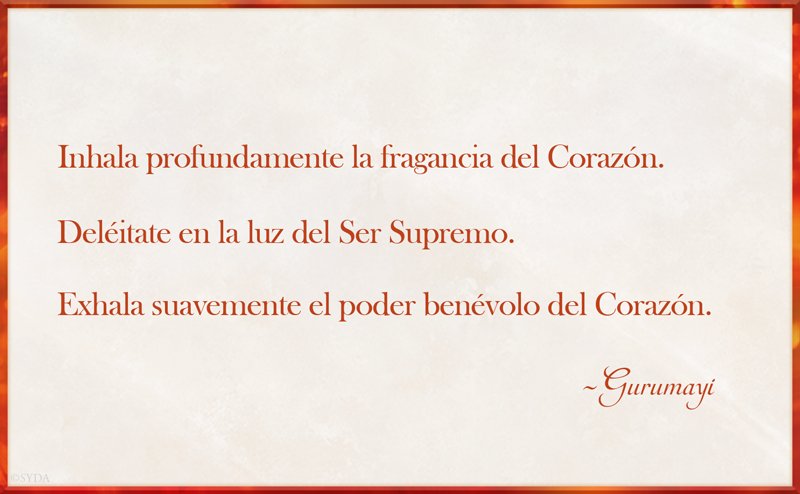 As I reflect on Gurumayi’s Message, I understand anew that my Heart is indeed the temple of God. 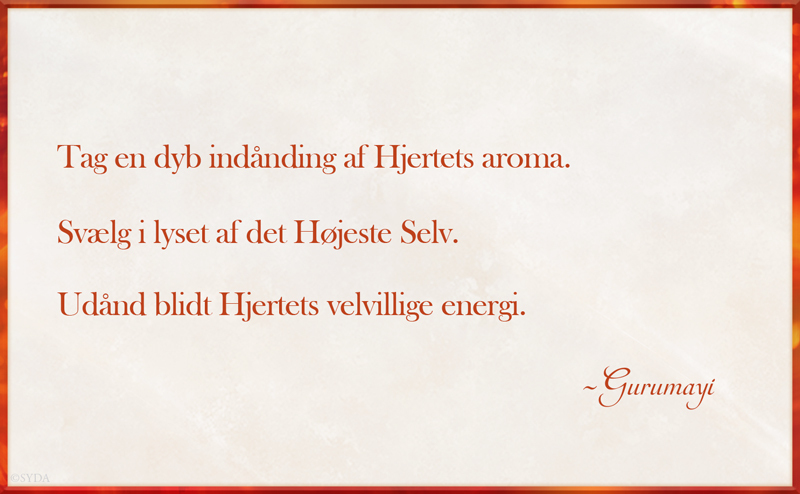 I feel such gratitude for Gurumayi’s grace and teachings that I want to share this feeling with the world. Thank you, Gurumayi, for A Sweet Surprise Satsang. Today, as I was contemplating the second line of Gurumayi’s Message for 2017, I experienced a sudden, intuitive understanding that I am constantly immersed in the presence of the Self. I realized that, even if I don't see the Self, it is always there. This experience has brought me tranquility. I recently spent time in nature, at the ocean’s edge. I sensed Gurumayi’s Message everywhere—in the ocean waves, in the tropical breeze, in the songs of exotic birds, and in the vastness of the night sky. As I silently repeated Gurumayi’s Message in rhythm with my breath, everything I was seeing seemed to breathe the Message with me. As I practiced and listened inwardly, my mind became peaceful and my heart filled with wonder. Thank you for this beautiful gift, Gurumayi. I cherish it. I have been thinking a lot about how to conduct myself as an awakened yogi in the world of today. Gurumayi's Message for 2017 gives me so much insight into this challenge. The first part of Gurumayi's Message is, for me, a reminder to open myself to the goodness of other people—to recognize and honor the positive energy emanating from their hearts. The second part inspires me to rejoice in the radiant light of that Consciousness that animates us all—and thus holds us in a profound unity. And the third part motivates me to contribute all that my own loving heart can offer to the world, in alignment with the needs of the situation and the opportunities it offers. I look forward with eagerness and gratitude to practicing this understanding in the months and years to come. Last night, I was repeating and contemplating Gurumayi's Message for 2017. Just before I fell asleep, I went into a meditative state in which I realized that I could offer of myself no matter where I was and no matter what was going on. I saw myself moving through my daily life with this secret treasure, and understood that it was much more powerful than any friction that might appear on the surface of relationships. I am so grateful that when Gurumayi gives us the Message for each year, she also gives us the grace to practice and experience it. I have been trying different ways to imbibe and live by Gurumayi’s Message for 2017. I sit for meditation and look at the Message. Then I repeat it three times. When I wake up in the morning, rather than going to my phone, I read the Message, making it the first impression of the day. When I get impatient, I breathe in and tap into my heart. I have to say, it's been great. Thank you, Gurumayi, for always teaching me the best way to live! Last week I went to the mountains in the south of Poland. It was beautiful and snowy. As I was climbing, it became tougher and tougher. At some point I was short of breath and I considered returning to our base camp at the bottom of the mountain. Then I remembered Gurumayi's Message for 2017. 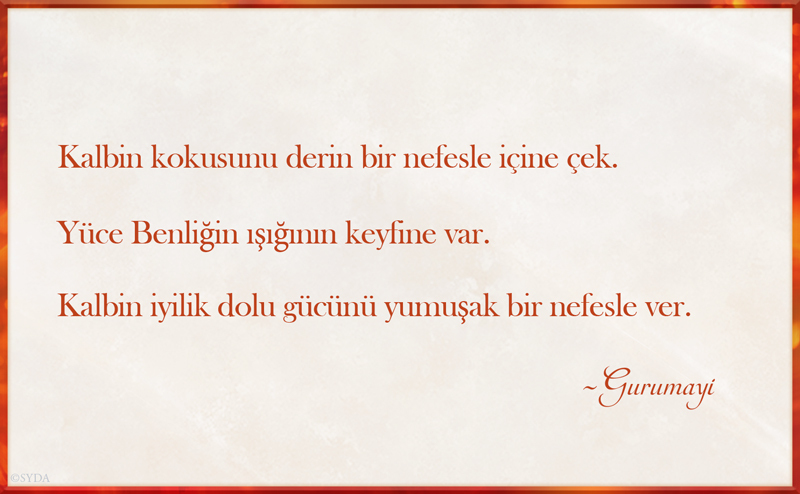 While silently repeating Gurumayi's Message, I began to breathe more naturally. With each step I focused on my breathing and on connecting to the Self. I practiced that until I reached the top of the mountain. By that point, I was so thankful to have a heart! First, I felt that it is such an important organ, and it is beautiful because it carries the divine energy of the breath. Secondly, I was grateful to be aware of the spiritual side of the Heart. Tears of thankfulness and joy filled my eyes. I will never forget that experience! 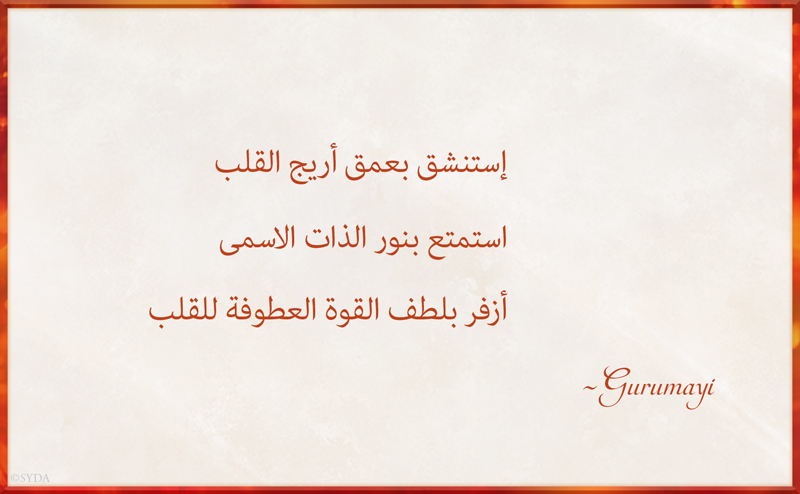 Thank you, Gurumayi, for all your teachings, and for giving us so much knowledge. I love you! When I first heard Gurumayi's Message for 2017, it led me to a deep experience. Holding the first sentence in my mind’s eye, I saw a doorway, surrounded by the void. It was beckoning to be opened. Then we chanted the mantra. When the second sentence was revealed, the door was open, with an open meadow visible in the distance, itself surrounded by the void. Then we chanted the mantra once more. When the third sentence was revealed, the meadow had become a pinpoint of light in the void. And we chanted again. As each sentence was revealed, I went deeper and deeper. It felt as though I were entering the Temple of Bhagavan Nityananda, becoming more and more immersed in the experience of the Self with each new revelation. 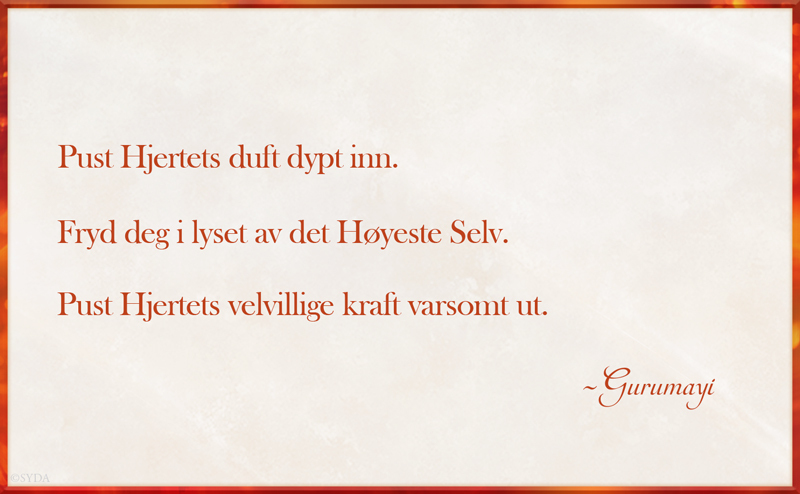 That morning I made the resolution to learn how to serve, guided by Gurumayi's Message, which has entered me deeply. I find myself giddy with excitement at this year of study ahead. Thank you, Gurumayi, for your boundless grace, love, and guidance! 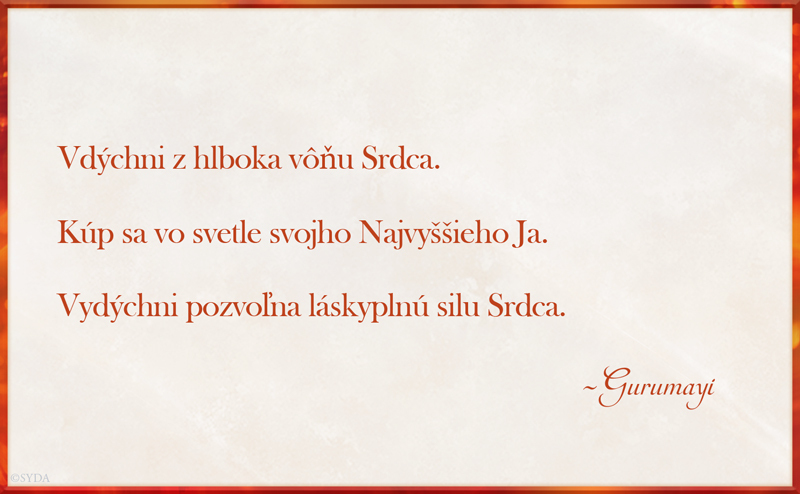 This is my first sharing on the Siddha Yoga path website. I participated in A Sweet Surprise Satsang 2017 and it has transformed my inner and outer existence. I feel so much more connected to the supreme Power and I feel blessed to have received this mahaprasad from Gurumayi. Gurumayi's Message for 2017 is ringing within my breath all the time. 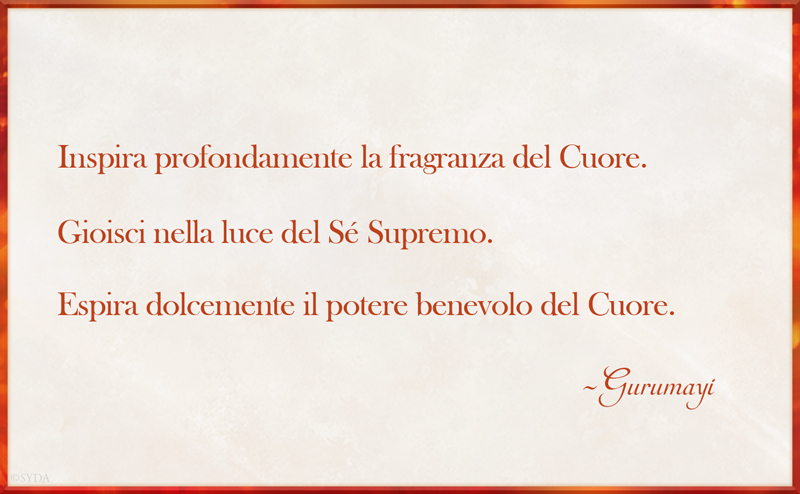 I thank you, Gurumayi, from the bottom of my heart for all of your blessings. On January 1 my husband and I were in Florida on a visit, and went to take photos of the sunrise at the beach. As we took in the newness of the day, the sound of the ocean waves breaking, and the expanse of white sand, we noticed three horizontal lines of clouds right in front of us. 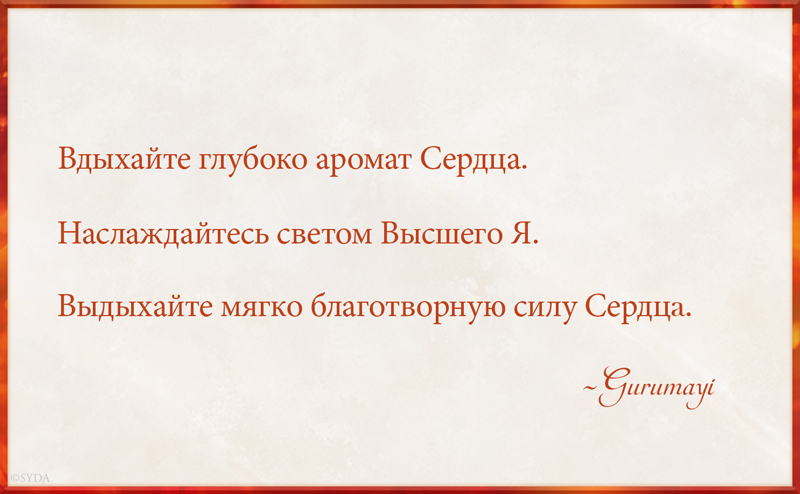 I said, "Well, that could very well represent Gurumayi's Message for this year." As we watched, an airplane created a fourth line, from right to left across the sky. Later, as I listened to Gurumayi’s Message for 2017, I realized that indeed, the universe had given us our own visual version! 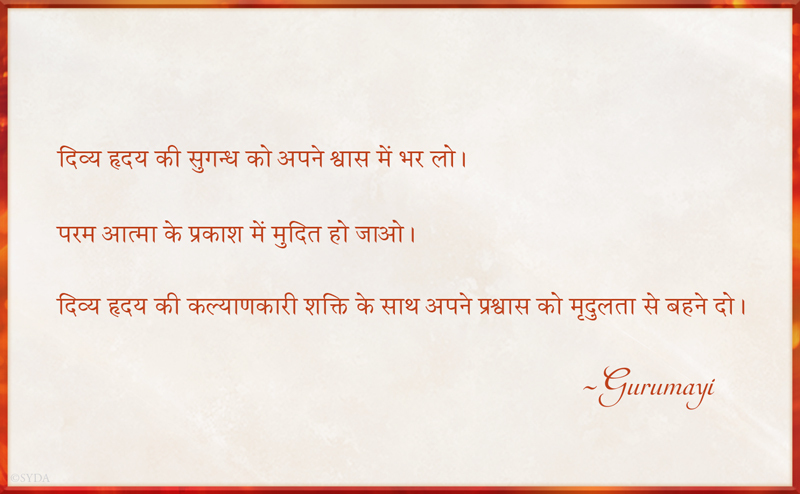 The three parallel lines matched the three sentences in Gurumayi’s Message; they were our prasad, a divine gift. To me, the fourth line—the "man-made" one—represented my effort and my capacity to make Gurumayi's Message my own as I apply the Message in my life. I know this image will continue to reveal more meaning to me throughout 2017. As soon as I read Gurumayi's Message for 2017, I followed the instructions. In the very first breath, I was drawn to a still point. The first line of the Message drew me immediately to the third-eye chakra. Then my mind viscerally and distinctly came to rest in the Self. And, finally, my awareness expanded softly as I exhaled. Participating in A Sweet Surprise Satsang was a magnificent experience. 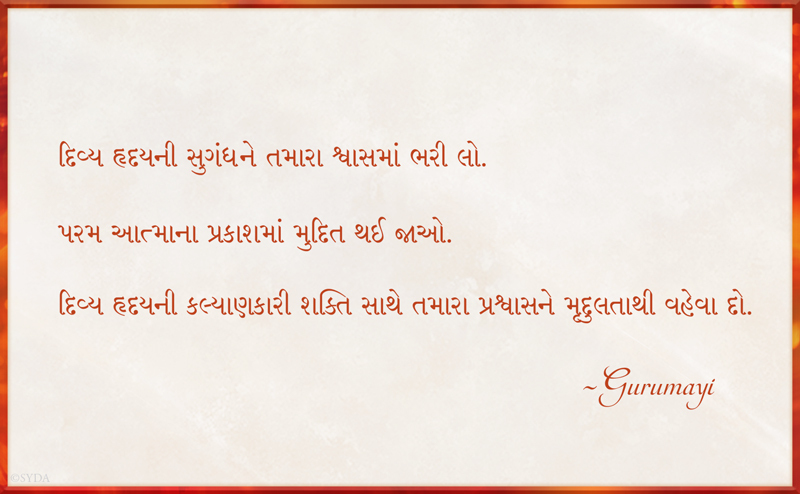 It gave me a huge sense of security and protection, and I felt blessed by the Guru’s darshan. 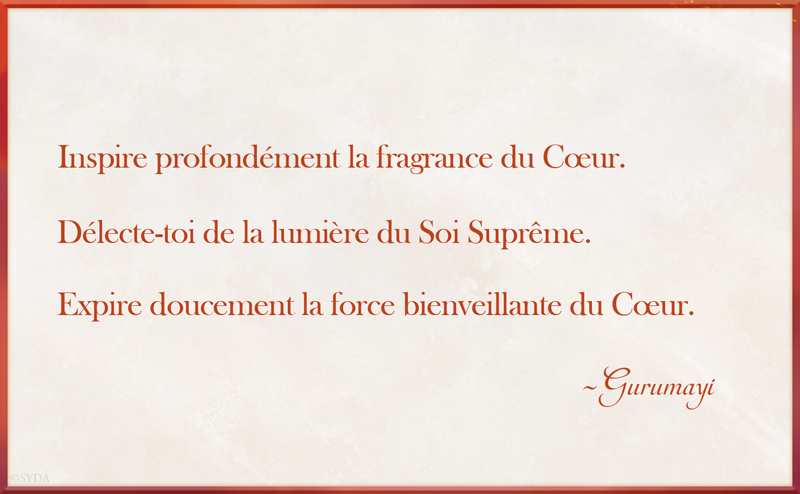 I feel gratitude for Gurumayi’s Message, which centers me within. It brings me into internal stability and centeredness, which I can then share externally, with others. Our family was so happy to hear Gurumayi's Message for 2017 that tears of gratitude fell. Each word was like a fresh flower for our hearts. Our baby was laughing and full of joy as we celebrated this meaningful path that we're so fortunate to walk. I've been practicing the Message for 2017, and I feel a stronger connection with the Guru inside. With great delight, I have been exploring Gurumayi’s Message for 2017. I have discovered that the Message supports an expanded meditative state even in the midst of activity. Flying back from holiday through crowded and busy airports a few days ago, I would breathe in the awareness of the divine presence in all that I saw and heard, and I would breathe out the blessing of this recognition to all around me. This flow of receiving and giving somehow made the experience stable. I went about my business delighting in a quiet inner joy and recognition. 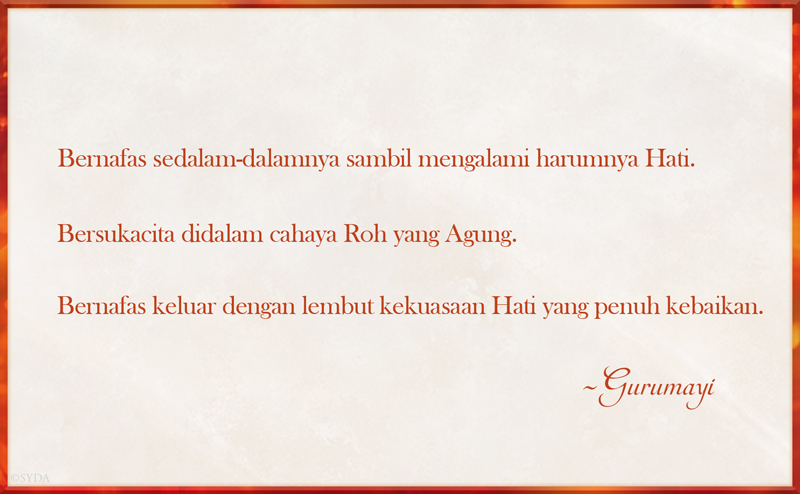 When I return to Gurumayi’s Message with focus and openness, I access this experience again. What grace! What a perfect gift the Message is! I keep unwrapping it and discovering new treasures. After receiving Gurumayi's Message for this year, I decided that every morning after doing puja before my meditation, I would repeat the Message. Today I started. I said the first line out loud. Immediately my mind was quiet, the thoughts left me, and my senses turned inside focusing fully on my breath. Then, the second line. I saw myself in my meditation posture in the dark. I saw the outline of my body, and inside there was only deep golden light from my head to my toes. There was nothing but golden light. It was so sweet and joyful. Throughout the day, this image kept coming back to my mind, filling me up with peace and happiness. I was really looking forward to A Sweet Surprise Satsang and hearing Gurumayi's Message for 2017. Over the past months, I had lost my focus. And somehow I knew that hearing Gurumayi's Message would help me press the reset button. And right away it started to work its magic. Instead of breathing in worry, I was breathing in sweetness! Instead of wallowing in anxiety, I was immersed in light! And instead of expressing anger, I could now switch to breathing out kindness. What a fabulous paradigm shift! As I listened to Gurumayi describe breathing out, I realized that all the words I speak are part of the breathing-out experience. So all of the words I use can express the goodness of my heart. As I received Gurumayi’s Message for 2017, I felt I was with Gurumayi, receiving it directly from her. I resolve to implement this Message in my professional life, teaching my students with the energy of my heart and performing all my duties from the light of the inner Self. I feel that by giving me this Message, Shri Gurumayi has sent her own heart energy and many blessings to me and to everyone. When the broadcast of Gurumayi's New Year's Message for 2017 ended, it was 3:00 a.m. in Sydney, Australia. I went back to bed, and as I lay there I began to follow my breath. I experienced a soft, gentle energy radiating out from my heart, supporting my entire body. I felt like I was being carried in God's love. I have been repeating Gurumayi’s Message for 2017 to myself at different times in the day. I love experiencing its poetic rhythm, which feels like a soothing balm for my soul. I feel that everything I need is contained in the Message. I am excited about studying and practicing it, and look forward to seeing how it unfolds for me throughout the year. I send my love and gratitude to Gurumayi. Gurumayi’s Message for 2017 has left me with filled with the awareness that the Guru's grace is present in every moment of my life. As I move through my day, when I rest at the end of the day, and during meditation—her Message is perfect in every moment of my life. With each breath, the awareness of the Truth is always there for my remembrance. Thank you, Gurumayi, for your beautiful gift! I am so grateful to Gurumayi for the gift of her Message for 2017! I felt a tangible wave of joy sweeping around the globe as we connected heart to heart with Gurumayi in the Universal Hall. The power, simplicity, and gentle invitation of this Message is exactly what I needed at the beginning of this year. I'm so excited to look for creative ways to practice this Message and especially creative ways to connect and bring my Supreme Self—my own good heart—into the world of my outgoing Self. What an adventure this year will be! I am so fortunate to have a living Master! As I slowly absorbed each word of the New Year Message, it dawned on me that it is an ongoing dharana for the year 2017. 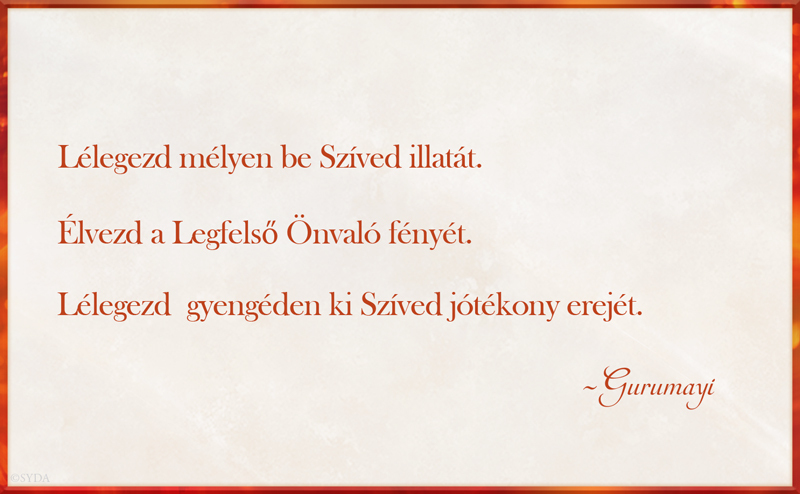 I have been slowly repeating Gurumayi’s Message as I settle into my daily morning meditation, taking each word into my being. I experience the desire to stay longer in meditation and just be there. I am very grateful for A Sweet Surprise Satsang and Gurumayi’s Message for 2017. I have been participating in the satsang with the website one or two times a day and practicing Gurumayi’s Message on my own in my own meditation practice and while walking my dog, doing yoga, cleaning, cooking, and now as I go to work with young people. I love that it reminds me to breathe and to see the world as my own Self. It frees me of fear. I find myself being quieter and more easeful in how I connect with others. My home feels like an ashram or meditation center. 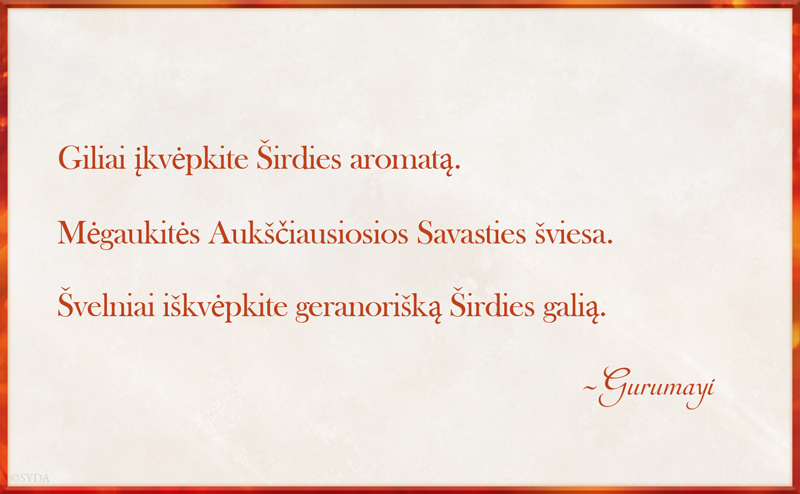 Practicing Gurumayi’s Message is such a gift and blessing. Gurumayi's Message for 2017 is for me the perfect "prescription" to take with me into the New Year. It reminds me so vividly of where my strength, my joy, my love, and my force for doing good in the world all originate: in the Heart. And it affirms for me that I can renew these inexhaustible gifts in every moment—by following, carefully and reverently, the three steps identified here. 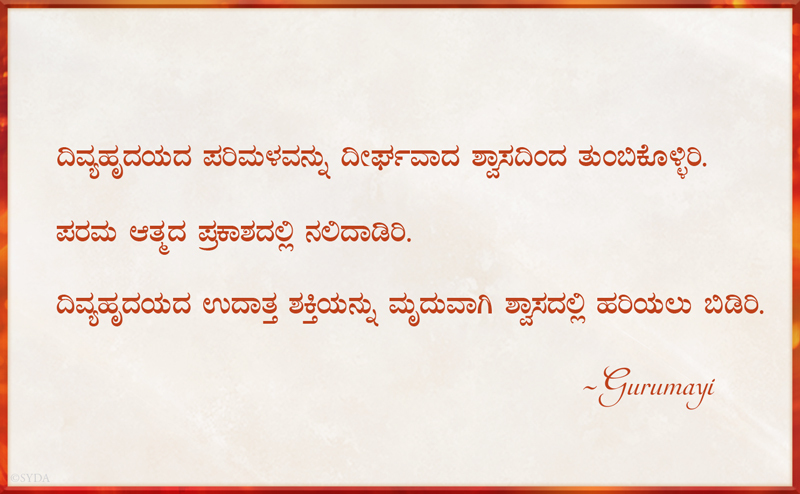 Thank you, Gurumayi, for this golden teaching. I know its radiant light will illumine my path for years to come. 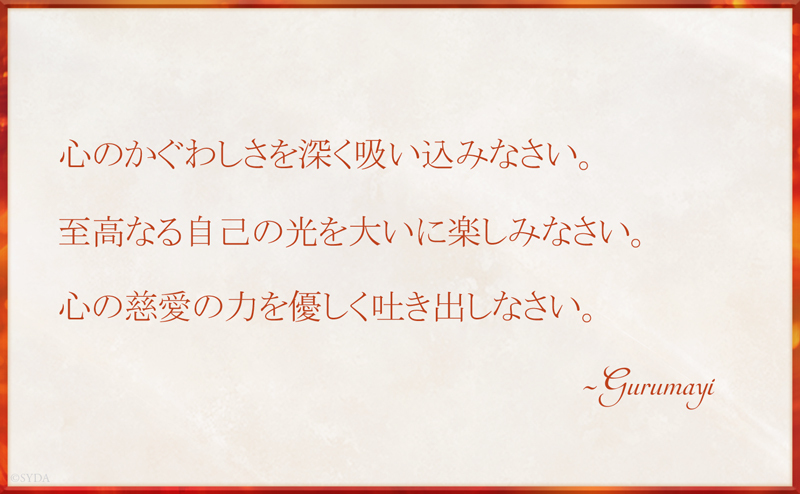 Yesterday, I heard Gurumayi’s Message for the first time, and I had a very strong experience. As Gurumayi pronounced the first sentence, my chest expanded and I stayed in kumbhaka—retaining my breath without any effort. With the second sentence, the experience was the same. I was very deep inside and remembered receiving shaktipat and seeing the golden column of light. With the third sentence, I had so much power in me that I had to remember the word "gently" to contain the experience. Gurumayi's Message brings me right into the silence of my heart. And I can feel a subtle vibration move around and around inside there. This year's Message is very powerful for me, like a physical touch, only much deeper and much more transforming. It feels like a new beginning, as if it has instigated something deep inside my heart that will unfold throughout the year. Thank you so much, Gurumayi, for this precious gift. Gurumayi's Message is a super-charged engine for my sadhana, an extraordinary gift for me and, I feel, also for the world. In repeating the Message during the satsang and in the hours since then, I've noticed that the words of the Message activate the experience that the words describe. It's a highly interactive Message that I can put into practice any time. Thank you, Gurumayi, for everything you do to make this world a better paradise.